BABSCon Gets Animated With Director Denny Lu & Steph Mahoney! The first West Coast pony con during season 6 invites you to get hype for for the March 26th premiere of Friendship is Magic and our latest Guests of Honor, two people who have been working on the series since Day 1 and who are going to make Season 6 the bomb: Director Denny Lu and Layout Supervisor Stephanie Mahoney! 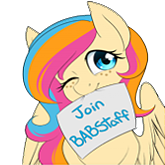 Starting today, BABSCon, April 22-24, is rolling out the red carpet, announcing the latest wave in our array of My Little Pony staff, community guests, and special events over the next couple weeks. The amazing Denny Lu and magnificent Steph Mahoney join our already massive guest list of Lauren Faust, Andrea Libman, Nicole Oliver, Kelly Sheridan, Terry Klassen, Josh Haber, G. M. Berrow, Katie Cook, Andy Price, Jenn Blake, and Kora Kosicka, in our 3rd year of rocking the Bay Area. Denny Lu was the Director of the last half of Season 5 and continues that roll into the just announced Season 6. On Friendship is Magic, he has also been credited as a Layout Supervisor, and Animation Director. Other career highlights include, Layout Supervisor on Equestria Girls, Animation Revisionist on Pound Puppies, Animation Director on Kid vs. Kat, and Animation Posing Supervisor on George of the Jungle. Steph Mahoney, currently Layout Supervisor, has also been an Animator, and Key Layout Artist on MLP:FiM and has been animating on other children’s shows such as Martha Speaks, Ruby Gloom, Kid vs. Kat, Littlest Pet Shop and Pound Puppies. She’s also been a Layout Supervisor in your favorite pony turned human movies, Equestria Girls: Rainbow Rocks and Friendship Games. And to build even more excitement for Season 6, use code S6HYPE10 during registration to save 10% off any membership for BABSCon 2016. Join Golden Gates, Silver Span, and Copper Chip in 47 days for one of the largest My Little Pony fan conventions in the world. Be warned though Golden gates and Co. may have trouble keeping Queen Quake and her henchies at bay.